recover deleted photos from SanDisk sd card . SanDisk SD card file recovery - Recover deleted photos from SanDisk sd card android quick format,full format,accidentally formatted permanently accidentally deleted after Virus attack, Recycle bin clear, disk cleanup, Press shift del by mistake, permanently empty recycle bin, shift delete ,accidentally deleted by a mistake. Use "Undelete" mode to recover deleted photos from SanDisk sd card. Use "Unformat" mode to recover deleted photos from formatted SanDisk sd card android after quick format,full format,accidentally formatted,reformatting,High-level formatting,Low-level formatting. Use "Full Scan" mode to recover deleted photos from sd card partitions show as "raw" or retrieve deleted photos which can not be found with "undelete" or "Unformat" or "Recover partition" ,recover photos from raw partition,recover photos of partitons which are not NTFS,nor exfat,nor fat32. support deep and full scan lost data from SanDisk sd card partition , hard drive, usb. If your smartphone run android version 4.0 or later , maybe will not be able to retrieve photo in four nomal ways ("undelete","recover partition","unformat", "Full scan" ), maybe the Internal SanDisk sd card can not be recognized as usb mass storage device by PC.Now you can use "android recovery" - . 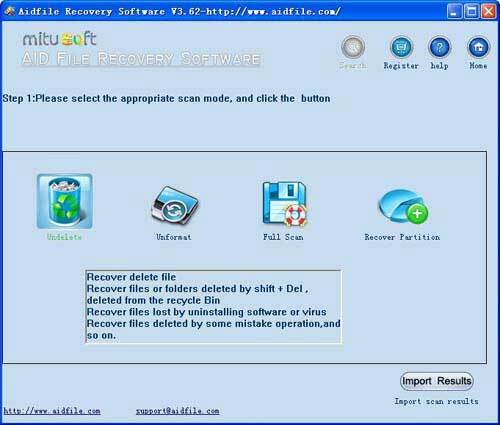 Aidfile Photo Recovery Software is safe non-destructive utility to recover and restore all missing, deleted, corrupted, damaged digital photos / pictures from media including compact flash, SD (secure digital card), SanDisk Drive, mobile phone memory, Windows hard disk drive and USB flash devices. Picture retrieval uneraser utility was designed to be compatible with Pen drive, Smart media, Memory stick, Compact flash, SanDisk drive and other format of digital films. How to recover deleted photos from SanDisk sd card?